The Kettler elliptical cross trainer Unix 10 is a high-quality elliptical cross trainer, which has its balance mass at the back and offers hence a small set-up space. Providing a balance mass of 22 kg, the machine guarantees the highest level of ergonomics and very comfortable, smooth training motion. The speed-independent induction brake generates a resistance of up to 400 Watt and adapts very quickly to the selected training programme or the required adjustments. The Premium display offers an intuitive use and a quickly understandable training control. By means of the central control button, you can quickly scroll through the menu and set quickly all training parameters. The pre-set training programmes are especially interesting, for instance: IPN system, Challenge Training, heart oriented training, and HIT Training. The HIT training (High Intensity Training) offers an intensive training within a short time, which brings you quickly to your limits. Within a short time, you train your body very intensively. Even a long time after the training, the body continues to "burn" many calories far above-average. The Kettler elliptical cross trainer Unix 10 offers many small but very practical and attractive details. Thanks to the transport wheels, the machine can be quickly moved and transported to another place in the training room. The new ends of the handles offer a very ergonomic grip. Thanks to the comfortable handles and ends, you can change the training position and hence involve your upper body in the cardio training. 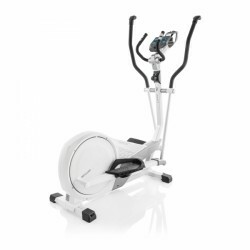 Kettler elliptical cross trainer Unix 10 add to comparison list.